The aftermath of Typhoon Haiyan in the Philippines is drawing less attention from the American public than a number of other major international disasters in recent years. About one-in-three Americans (32%) say they are very closely following news about the deadly typhoon that struck the Philippines on Nov. 8. By comparison, 55% of the public closely followed the aftermath of the 2011 tsunami in Japan, 58% followed the tsunami that struck coastlines around the Indian Ocean at the end of 2004, and 60% followed the 2010 Haiti earthquake. In the new national survey, conducted Nov. 14-17 among 1,013 adults, Typhoon Haiyan tied with economic news as the second-most closely followed story this week. 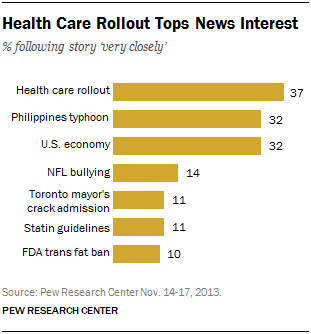 The health care rollout was the public’s top story, with 37% following it very closely. 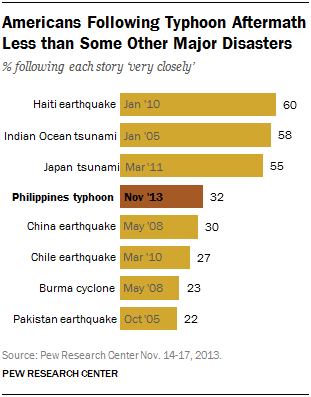 Attention to the Philippines typhoon is similar to the levels of interest in the 2008 earthquake in China (30% followed closely) and the 2010 earthquake in Chile (27%). Up to this point, the share of Americans making donations to the Philippines trails donations to natural disasters that got more attention: 14% say they have donated to storm relief efforts. The share of the public that has donated so far is somewhat less than after the disasters in Haiti, Japan or the Indian Ocean. In the past, many have donated to relief causes after the first week. For instance, after the earthquake in Haiti, far more said they donated in a survey conducted after 3-4 weeks (52%) than had said they donated in the first several days (18%). Currently, in addition to the 14% who say they have already made a donation, another 17% say they plan to. But two-thirds (67%) say they do not think they will donate right now. Compared with some of these other previous international disasters, interest in the typhoon is lower across all age groups. Among adults 65 and older, 45% followed Haiyan very closely last week, compared to the 67% who closely monitored the Japanese tsunami. 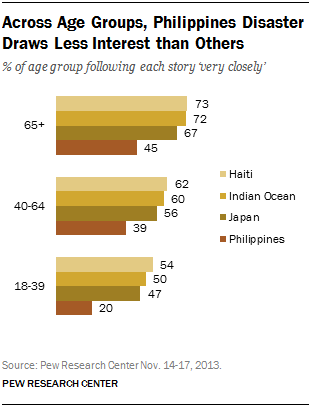 Interest has been particularly low among adults younger than 40, just 20% of whom have followed the aftermath in the Philippines last week, compared to the 47% who tracked news from Japan in 2011. Among the 14% of adults who have donated so far, about twice as many donated via traditional means than over the internet or via text message. Roughly three-in-ten people who donated to relief efforts did so digitally (31%), while 63% donated in person, over the phone or through the mail. The primary means of digital donations was over the internet (22% of all donors), with just 7% donating by text message. Fully half (51%) of donors say they gave in person, such as at church. These patterns of donations are similar to other recent disaster relief efforts, with no growth in the share using digital donation tools. For more on donations and interest in past foreign natural disasters, see “Most Are Attentive to News About Disaster in Japan,” March 22, 2011. And for a detailed study of donors to the “Text to Haiti” campaign, see “Real Time Charitable Giving,” Jan. 12, 2012. The most closely followed story this week was the ongoing rollout of the 2010 Affordable Care Act, with 37% saying they followed reports “very closely.” Roughly equal shares of Republicans (43%) and Democrats (36%) followed health care news closely. 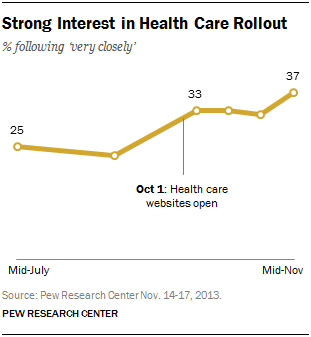 Since the Oct. 1 launch date of the health care exchanges, there has been sustained public interest. But interest among younger adults continues to lag: About one-in-four (24%) of those under 30 and 30% of those 30-49 followed health care news very closely. By comparison, about half of adults 50 and older (49%) closely followed the rollout. About one-in-three followed news about Typhoon Haiyan and the U.S. economy very closely (32% each). In its second week in the headlines, bullying accusations within the Miami Dolphins football team were followed by 14% of the public. Men (17%) are more likely than women (11%) to say they followed the story very closely. Americans express relatively limited interest in news about Toronto Mayor Rob Ford, as well as news about new guidelines for the use of statins or the FDA’s proposal to severely limit the use of artificial trans fats.